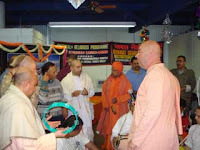 18th Annual Astaprahar (24-Hour Kirtan) ~ The Toronto Hare Krishna Temple! This weekend, devotees from ISKCON Toronto as well as visiting devotees from ISKCON Montreal will be participating in the 18th Annual Astaprahar: 24-hour non-stop chanting of the maha mantra. The program is being held at the Tagore Center, 140 Millwick Drive, Toronto (Islington and Steeles Ave West), Phone: 416-740-7222. The program begins at 9:00am on Saturday May 1st, and the kirtan will be kicked off by our very own Bhaktimarga Swami at 10:00am and will continue till 10:00am on Sunday.